January 28, 2011 Frenchtown, New Jersey, U.S.A. – MachineartMoto, designers of specialized products for BMW motorcycles, introduces the MudSling 12-R designed to fit the BMW R1200R. 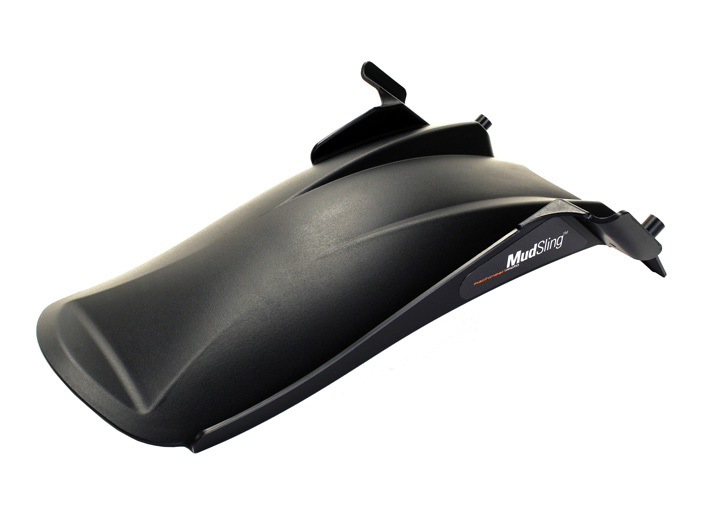 The MudSling, originally developed for the BMW R1200GS and F800/650GS, extends the successful rear fender formula to the R model providing mud, water, tar, and rock splash protection for the suspension, battery area, and back of the engine. It reduces clean-up maintenance and protects surrounding cast and painted parts from pitting. “Customers have been asking for a rear fender solution for their R1200R’s that is more affordable and sturdier than a hugger formerly available only from Europe”, says Andrew Serbinski, President of Machineart. “A hugger must be cantilevered over the tire since the only place to mount it is to the single-sided paralever arm and is thus subject to bending and vibration.” The MudSling mounts directly and firmly to the underside of the frame with two screws and with zip ties to the side frame tubes. It installs easily in 5 minutes and, with its signature MachineartMoto visual flair, looks beautifully integrated with the R1200R. The MudSling for the R1200R comes in Standard & ESA versions.